Having a boat to enjoy on a calm, peaceful lake is a great way to enjoy a warm summer afternoon. It’s also a great way to go fishing on a budget, have an adventure down a river, or a number of other water recreation activities that you may have in mind. To have the best experience possible, you’re going to want the best inflatable boat. For the fraction of the price of a traditional hull, you can get all of the benefits of boat ownership. Your money is valuable. It shouldn’t be wasted on a terrible product. The inflatable boat reviews in the chart below will quickly direct you toward the contenders in this field so you can stay away from the pretenders. How Can I Find the Best Inflatable Boat For Me? There are a number of different factors that must be considered when purchasing an inflatable boat. The purpose you have for it, the environment you plan to store it in, and even where you plan on floating it all play a role. With different designs and different fabrics and materials available to you, there are some key questions that you need to ask yourself right now. In what will I be using my new inflatable boat? Where will the boat be stored if I’m not using it for some reason? How often will I need to deflate it for storage? Will I be using the boat in lower latitude waters? Do I need a boat for rowing or one that can hold an outboard motor? The one question in here that many people don’t ask themselves is about the latitude of the waters where the boat will be floated. Lower latitudes have a greater level of UVA/UVB in the sunshine that contacts the boat, which means the construction of the materials must be reinforced so that it won’t lose structural integrity. Once you’ve answered these questions, the next step is to find good information about the best inflatable boats that are available. That’s where the Salty Dog can help you out a lot. My reviews here are designed to give you the information you need so that you can make a solid decision that you can be happy about. What Makes a Good Inflatable Boat? Lots of people will look at the materials of the inflatable boat first, but that’s not what I’d recommend. Every inflatable boat has seams that are placed in certain locations to combine the materials in an airtight way. Some seams are butted, while others are overlapped, but they are always glued together. Butted seams are the best, but they take longer to make, so boats that have them generally cost a little more. Having a boat that is double taped along the seams, no matter what kind of seam it happens to be, is the best solution possible. Great materials are worthless without great seams. Whether you want the best inflatable fishing boat or you just want an inflatable dinghy to get out and enjoy a nice day, all inflatable boats share this characteristic. There should also be extra reinforcing along certain areas of the best inflatable boats because they see extra user wear and tear over time. This is especially true under the towing straps and with the tow rings, but the bottom of the prow can’t be ignored either. You’ll also want to look for material reinforcement along your paddle/oarlock attachments, the tubes that inflate the boat, and the stern – especially if you’re planning on using an outboard motor. What Are the Different Types of Inflatable Boats? There are plenty of different designs today when it comes to the modern inflatable boat. That’s why having information to review before a purchase is so critical to the ownership process. Do you want a smaller, lighter, but softer boat? Or do you want something that is larger and more rigid? The first consideration here is the type of outboard motor you’re planning on using with your inflatable boat. Some have soft transoms, while others have hard transoms that need to be assembled when you begin to inflate the boat. Stronger transoms will support heavier outboard motors. If you don’t plan on having an outboard, then you can do with a soft transom. Some inflatable boats have a bit of a rigid hull built into them. This helps to reinforce the structure of the boat and makes inflating it easier since tubes are being filled with air instead of a whole boat. These boats are a little more difficult to store, however, because they can only be compressed to the size of the reinforced frame. These boats are a lot heavier and reduce the risks of damage from beaching should it occur. If you plan on inflating and deflating your boat after every use, then the best inflatable boat for you would be one that has a high-pressure inflatable floor. This design makes the boat a lot lighter and they are easier to handle. They don’t have the same level of rigidity as other inflatable boats, but they still provide a way to get out and enjoy some water recreation. What Are the Prices of Inflatable Boats Today? If you’re looking to get a great deal on inflatable boats today, then you’ve got to shop online. 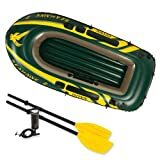 On a website like Amazon, you can get a good quality inflatable boat for about $200. Entry-level boats can be found for less than $20 at times. If you’re willing to spend about $350, you’ll find even higher levels of quality with a number of different structural styles available to you. Although some inflatable boats can be priced at the $2,000 mark, most users will find that a top of the line boat for $700 or less will meet all of their needs. This inflatable boat has 3 air chambers that give it an extra level of buoyancy, including a unique auxiliary air chamber. The all around grab line that surrounds the boat is useful for a variety of reasons and the welded oar locks or reinforced to be tight and secure. It fills up quickly and deflates fast thanks to the Boston valves and the inflatable floor gives users some added comfort and maneuverability. Four fishing rod holders are included to enjoy a morning of fishing before an afternoon of paddling. This green and yellow beauty offers the typical 3 air chamber design and the inflatable floor in this single person design. Technically a couple small people could potentially fit into this boat, but unless we’re talking about kids here, I wouldn’t try it. Don’t let the low price tag fool you either. The Seahawk II comes with motor mount fittings if you need them and the oar holders and locks are welded and reinforced. It’s made from 20-gauge vinyl and holds up to 440 pounds. This is definitely a one person inflatable and it isn’t designed for heavy lifting. It’s perfect for having an afternoon in the pool, cocktail in hand, as you float about in the privacy of your backyard. You can’t miss the bright orange color, but that adds to the festive feelings that come from enjoying some time away from the stresses of life. The welded oarlocks are surprisingly solid, but beware that this boat can only hold 120 pounds. Sorry men. If you want to take 3 buddies out fishing in a comfortable way and still be able to bring a bunch of gear, namely beer and bait, then what affordable options do you have? Not many. That’s why the Intex Excursion 4 person boat is such a great value. It’s been designed with an I-beam within the floor so that there is a higher level of stability when someone snags the big one on his or her rod. It has motor mount fittings and the inflatable seat cushions to fit into the boat are included. There are 2 fishing rod holders, which is the only odd thing about this boat since it seats 4. This is another 4 person inflatable, but out of all the best inflatable boat reviews, this one might just be the toughest. It’s triple strong – literally. It’s got three separate layers of material so that there is protection against light punctures, beaching, and the other damage issues that inflatables face. There’s also an inflatable keel available that provides improved handling and control. Plastic flooring is installed for added rigidity. A high output pump has been included, as are 2 fishing rod holders, and there are rotational oarlocks on the sides that are super solid. There’s only one-way to describe this boat: it’s large and in charge of your water recreation. Some might think that the best inflatable boat is a cheap alternative to a real boating experience, but one look at these boats today will prove the naysayers wrong. If you want a great afternoon enjoying the waters of your backyard or the river down the road, then trust the Salty Dog – an inflatable boat is a great value purchase.